The manatee is a special mammal that, despite having aquatic habits and a conformation similar to that of fish, is nevertheless a mammal. The manatee inhabits the mouths of the rivers, in Central America, and Amazonia, sometimes in North America, in shallow pools, stagnant and quiet places, in search of the submerged vegetation, which is the basis of their diet. 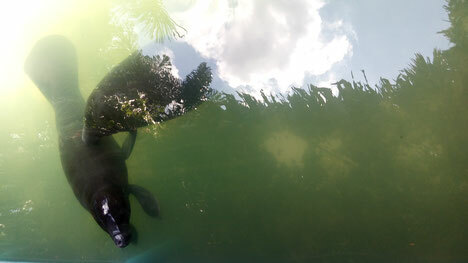 The manatee is a totem that speaks to us through its way of life of peace, tranquility and balance in the water. The body of the manatee in the form of a torpedo, is specially arranged to easily cross the waters, in which it spends its entire life. Head, neck, trunk and tail meet intimately forming a single body, cylindrical and fusiform. It is distinguished by its flattened and spoon-shaped tail and by its two fins with three or four nails. The manatee is gray, sometimes with white spots on the belly. The skin of the manatee, naked and rough, is covered with short and very scattered hairs, without forming a real fur that could hinder its locomotion, underneath it is a thick layer of fat, which protects it from the coldness of the environment in which lives. The mouth of the manatee has a split upper lip, its lateral parts are so mobile that they act as scissors, and tear the leaves and stems apart. Numerous stiff and short bristles cover the lips and act as true tactile organs. The teeth of the manatee present only some atrophied molars and instead of teeth, horny plates that serve to chew their soft foods. The manatee has no ears and its most developed sense is sight. No doubt the manatee does not stand out for its beauty or stylized figure but it is such a timid animal, so meek and so inoffensive that its face, in spite of not being pretty, begets an irresistible tenderness. The manatee is a shy and harmless animal. The manatee is seen alone or in small groups, and is a totem that speaks of simplicity, humility, living without pretensions but in a happy and balanced way. The manatee is the only fully herbivorous marine mammal. Its main food is marine herbs and aquatic plants that grow in shallow places close to the coast or at the mouths of rivers. It is a totem that speaks of nonviolence, is incapable of killing any other living being, despite its large size. The manatee is the totem of peace and harmony. Manatee is motherly and tender with her children. They are faithful animals, affectionate with their partner, it is nice to see a pair of manatees, and that is why the natives refuse to kill them when they see them as a couple, because it is like killing the spirit of love and fidelity. The manatee is an ideal totem to preserve the love of the couple and protect it from all evil. Manatee totem is pure kindness and affection. Manatee totem is childish and playful. Manatee totem is pure love, fidelity, affection and loyalty to the couple. Ideal totem for the love of a couple. The manatee totem is ideal for enhancing kind, relaxed, relaxed and open relationships.